Families probably spend more time and energy planning for a Bar or Bat Mitzvah than any other life cycle event. From the time they receive a date until the day the momentous occasion occurs, much effort and emotion on the part of the families are invested in the success of the special day. But what does success mean? How is it measured, if it is measured at all? 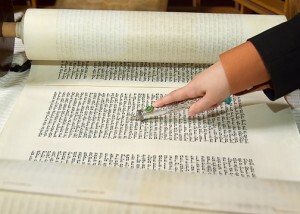 When a child ascends the Bimah on his Bar Mitzvah or her Bat Mitzvah day, it is really the culmination of a process that has been in existence for several years. When the children enter Religious School in Aleph, third grade, they begin learning their Hebrew letters and vowels. With practice both in school and at home, students should be comfortable functionally reading Hebrew words and sentences by the time they are in fifth grade. The key here is practice. Attendance at services on Shabbat morning and Friday evening also leads to greater comfort with Hebrew language. All the required prayers students will need to know for their Bar or Bat Mitzvah, regardless of whether it will be held on Shabbat morning or afternoon or a Sunday morning holiday or Rosh Hodesh are available on the website and are listed by grade: https://www.ohev.org/ohev-shalom-tfillah/ At this point attendance at services becomes more critical, because children need to become more comfortable with the Friday evening service and the service that will mirror their Bar or Bat Mitzvah service. Even though many prayers are introduced during their school sessions during the week, reinforcement at Shabbat services is extremely helpful. The children begin more formal training eight to ten months prior to their actual Bar Mitzvah date. For some that is during their Dalet year, sixth grade, while for others it may be early in their Hei year, seventh grade. They begin private one-on-one sessions with Cantor Ocanto-Romo to work on their Torah and Haftarah portions, if applicable. Weekly lessons continue up to the week of the Bar or Bat Mitzvah. Rehearsals are held in the sanctuary prior to the actual Bar or Bat Mitzvah day to help bring together all of the elements of the service for the family, as well as for the child. Returning to the questions in the opening paragraph, every family and child has their own definition of success. In business terms families now measure their return on their investment. The investment is mainly one of time. Time for practice and attendance at services are the primary commitments needed for the Bar or Bat Mitzvah child to perform both successfully and comfortably on the Bimah.